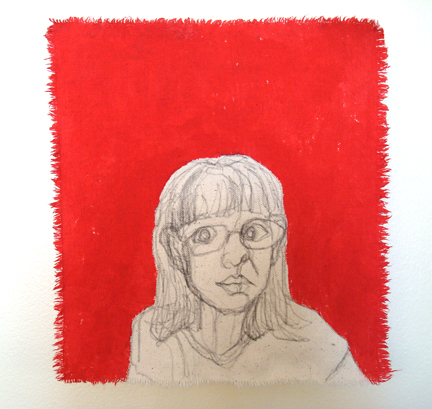 One day I woke up with this idea for a self‐portrait, on raw canvas, with pencil, and a solid red background. It was so clear in my head. And I just sat down and did it. Why red? I have no idea. Like I said, it was just this idea that suddenly came into my head. Perhaps I had a dream the night before involving the colour red, but I don’t remember. Then I would think to myself, am I worried? I don’t feel worried. Should I be worried? Before this, making art feels somewhat like an obligation. I should make more art, since I graduated from art school and all. And I do enjoy the process once I get started. But then art school was what gave me the idea that what I make will never be considered art. Yes, I need accomplished artists to validate what I make, because just on their own my art and my stories behind them aren’t good enough. I need to name‐drop, that’s what it is. Well, I don’t know how to name‐drop. I only know what I like. I like to make things, but if that’s what the “art world” is like then I don’t like it and I don’t want to be part of it. So I still paint, less often than I’d like, because it remains a struggle, with the above comments plus many more coming back to me with every line and every brushstroke I make. Maybe it’s true. I’m just not good enough to be an artist. And I don’t handle criticism very well. I know that about myself. I’m working on that. Then recently, through one of the blogs I read I came across the work of Barbara Cole, a Toronto‐based, self‐taught photographer. I was immediately drawn to the watery, painterly quality of her photographs. Then I looked through her Toronto Series and read the artist’s statement. And I cried. I was so moved. It was so honestly written. So plain, so unpretentious, and so beautiful. Somehow, reading that, made it OK to paint again. It was strange. 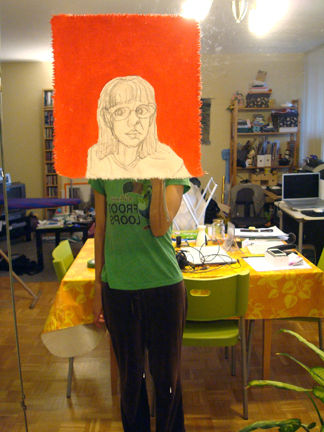 But it was after reading that one statement that I painted the self‐portrait. I mean, I didn’t make up excuses or find other things to do or put it off, I just went and painted it. 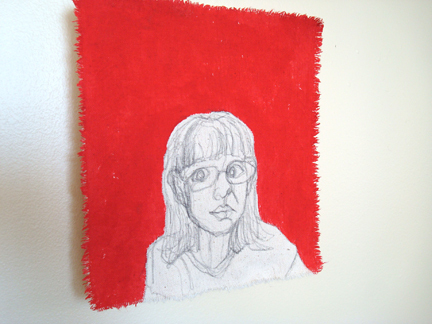 Ideally, I would like it to be hung a bit away from the wall, so the fringed edges of the canvas cast a fringed shadow. Should’ve stuck my hand out to take the picture… oh well. So, is it art? Absolutely. But only recently have I come to that conclusion. I run art groups sometimes, and I always tell the participants that anyone can make art and everyone is creative in their own ways. So why can’t I believe that about myself? 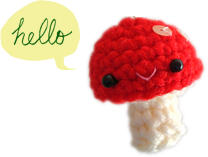 I realize that this post is less than cheerful, which is unusual, so thank you for bearing with me! It’s just one of those days. But at the end of the day I’m happy about what I made and I will find ways to do better. I took a course on aesthetics once. The whole history of it is fascinating — one generations beauty is another’s trash. I suppose what I took away is that anything created with purpose can be art; the value of it is just subjective opinion, convention, and, often, pretension. I am happy you are painting again though! I am so honoured that we can have some of your art in our home — I honestly absolutely love everything you produce. Funny, I took it as a reflective post that had quite a positive conclusion — ah the wonders of interpretation! I love that you shared your process, and made your vision real — I always have such trouble with that second step, great job! I’ve found that in art school there’s two things: what you think works and how your teachers push buttons to make you go further. Sometimes that push can be in the right direction and you really get somewhere because of it. But other times, it’s best to just keep your feet tightly on the ground and stick with what your heart tells you. In the end, YOU have to be happy with how things went and what you came up with.